On a hot midsummer day in Moscow, the courtyard of the All-Russian Museum of Applied Arts looks like an enchanted forest. Hundreds of colourful ribbons hang from tree branches. 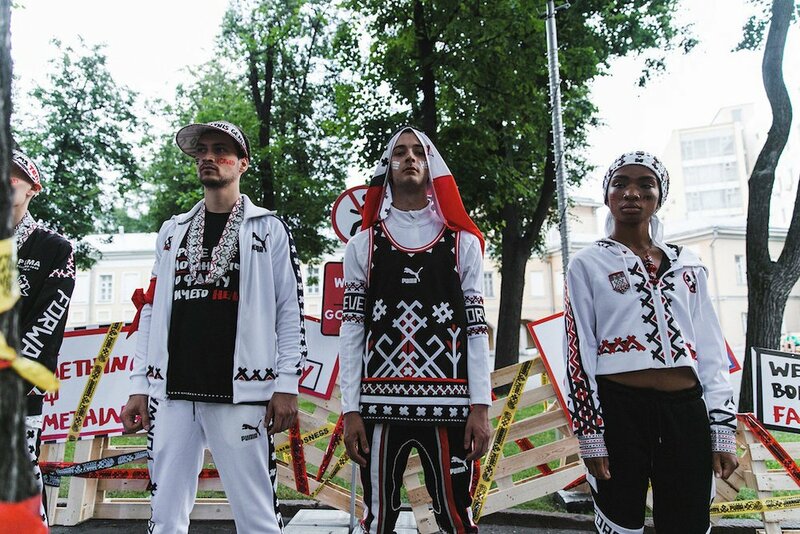 Decorated with traditional Russian emroidery and the words “Jahnkoy” and “Puma”, others are styled to resemble the police “do not cross” yellow tape. 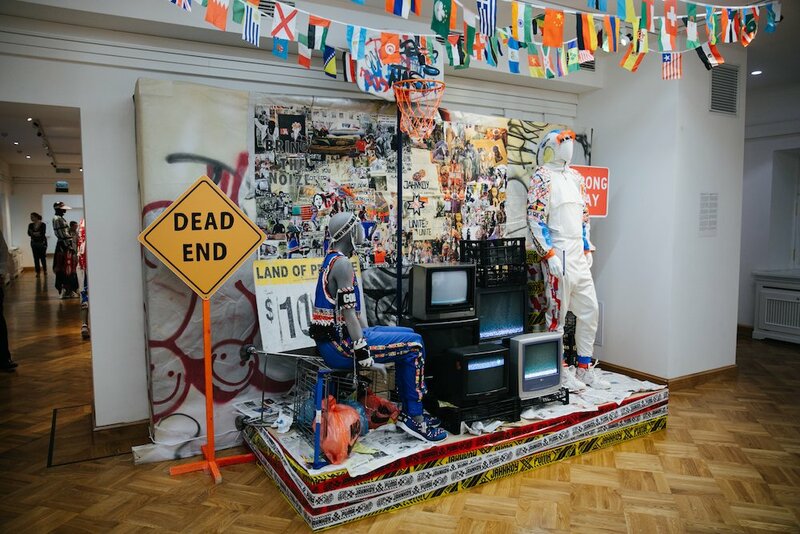 For two weeks, this quiet museum, usually popular among senior citizens and school groups, is hosting an exhibition of the New York-based label Jahnkoy and its tribal, planet-conscious futurism. Jahnkoy: Deceived No More welcomes the visitor with leftovers of globalisation: a bunch of old TVs shimmering with white noise, a wall of graffiti and a vibrant assemblage of plastic bags. 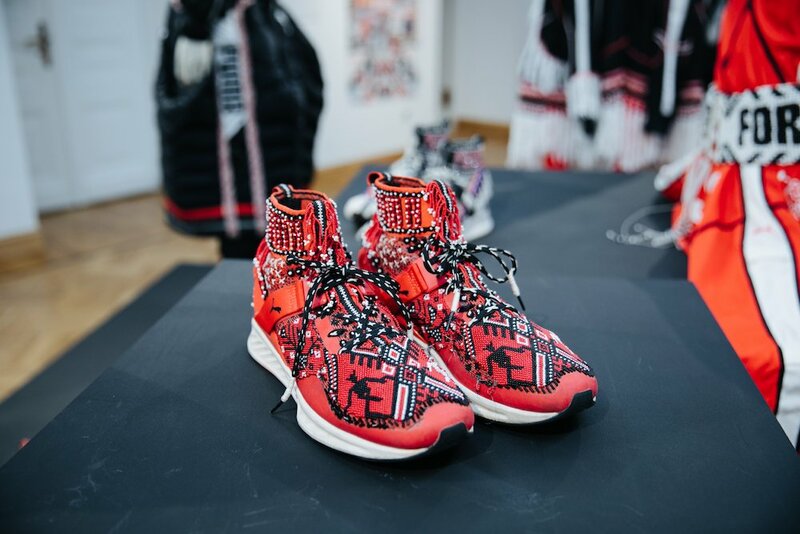 Among them, the garments displayed on two mannequins look like ordinary sportswear, but a closer look reveals that the brightly-coloured pattern on sleeves and trainers is actually the intricate work of beading, weaving and embroidery. 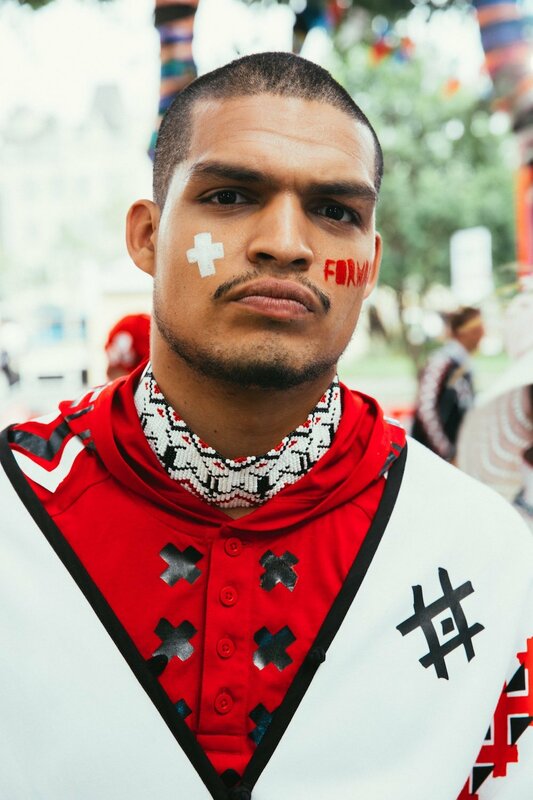 If sportswear is a symbol of globalisation, the reference to traditional crafts is a comment on the world, post-globalisation — the patterns are woven using multicoloured plastic threads, the same material which litters every foot of coastline around the world. Jahnkoy first appeared on the cultural radar after making it into the 2017 LVMH Prize shortlist. The collection, titled Displaced, drew on fast fashion and its catastrophic effects — “the donations of Western clothes to the African continent, and the way it brings destruction to artisanal crafts, tradition and culture”. Some critics were surprised to trace the creative path of Jahnkoy’s founder and designer Maria Kazakova to Russia. Born in Novosibirsk’s Akademgorodok, Kazakova lived in Abakan in the Siberian region of Khakassia and Moscow, before moving to London to study at Central Saint Martins and eventually New York to attend Parsons School of Design. If Jahnkoy was born in NYC’s diverse melting pot, the latest collection, titled Deceived No More aka Born to Appropriate is a kind of homecoming for Kazakova. 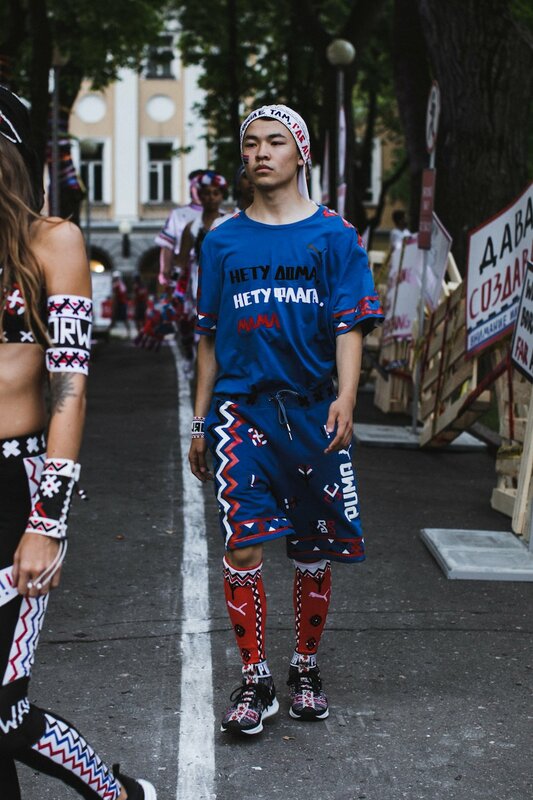 Born in 1988, Kazakova grew up during the turbulent 1990s, when an avalanche of Western pop culture and cheap Chinese goods completely transformed the post-Soviet cultural landscape. 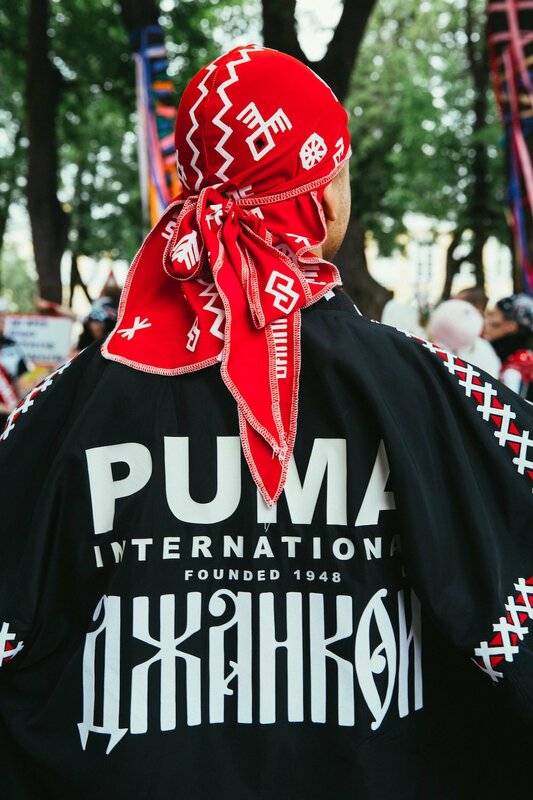 In recent years, the decade has been a source of inspiration for many designers, including the cutting-edge Russian youth culture pioneer Gosha Rubchinskiy. The result has always been fairly homogenous, relying solely on sportswear. Kazakova, by contrast, delves deeper and brings up something much more complex and strange: wild futurism in a patchwork of folklore and global iconography, like Ivan Bilibin’s fairy tales on acid. As a teenager, Kazakova got into reggae music, which she cites as one of her formative influences. For her, clothing is clearly a language which incorporates all these elements: the day we meet, Kazakova is wearing a long floral dress, an abundance of jewellery and massive silver rings, a scarf over her hair and black lipstick. On a few occasions more recently, Kazakova has been spotted wearing a kokoshnik, a traditional Russian crest-shaped headdress. 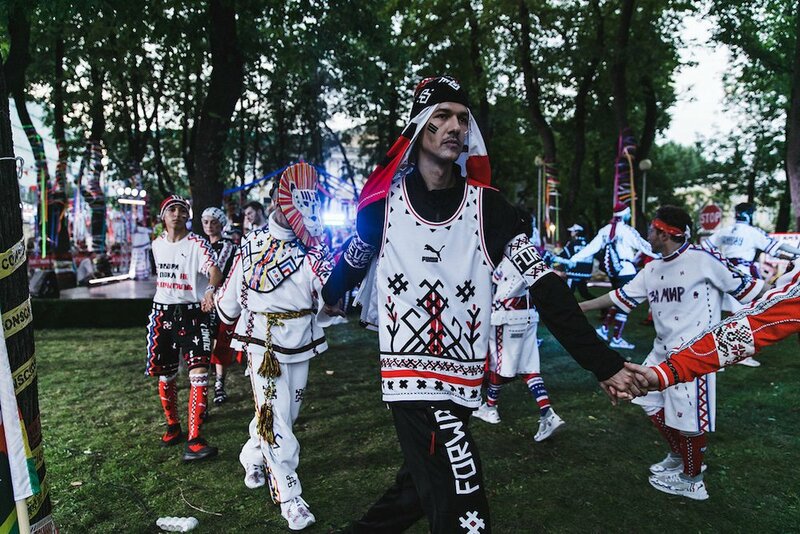 On the streets of Moscow, among people dressed largely in mass-produced clothes, Kazakova looks like a gypsy futurist or a shaman of some otherworldly nation. 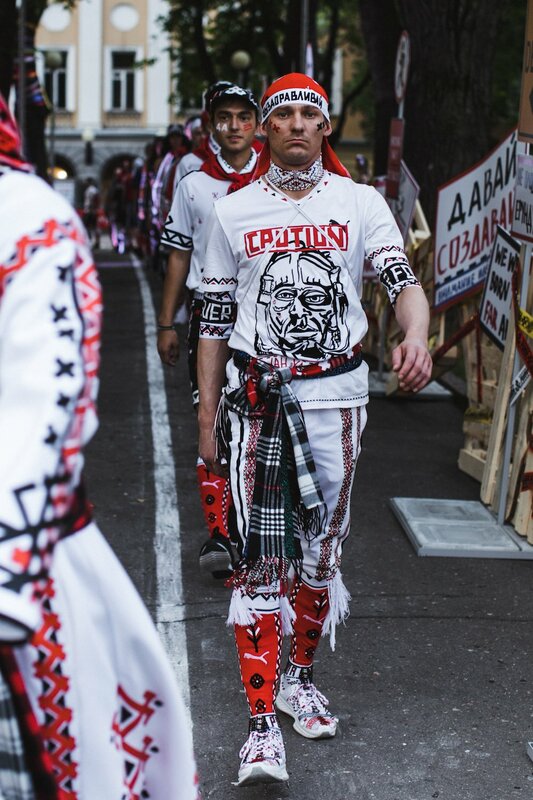 Overall, the ethos of Jahnkoy relies on two key notions: drawing much-needed attention to the state of global fashion and its impact on the world, and the political meaning of craftsmanship. 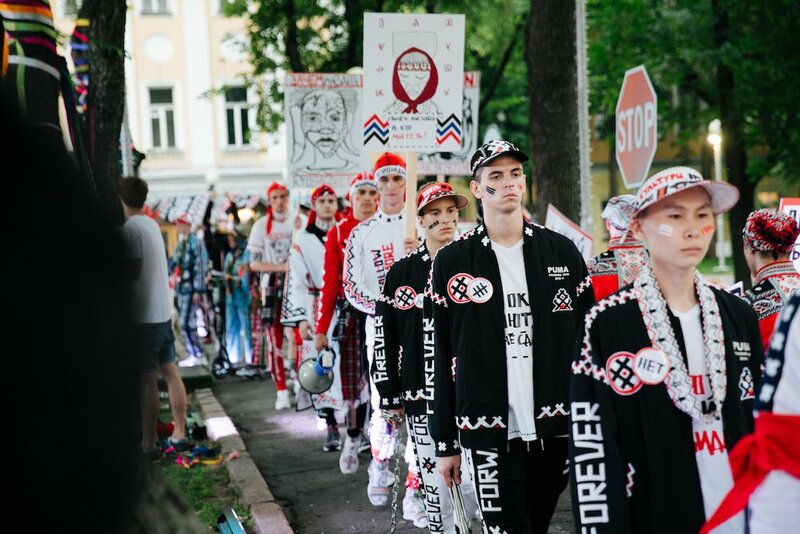 In a world dominated by fast fashion, Kazakova is trying to educate people about the importance of investing time and labour into garments — why buying a $5 T-shirt in London or Berlin will inevitably have an impact on the other side of the world. Kazakova currently produces everything in Brooklyn, with aims to outsource parts of the beadwork to India in the near future. 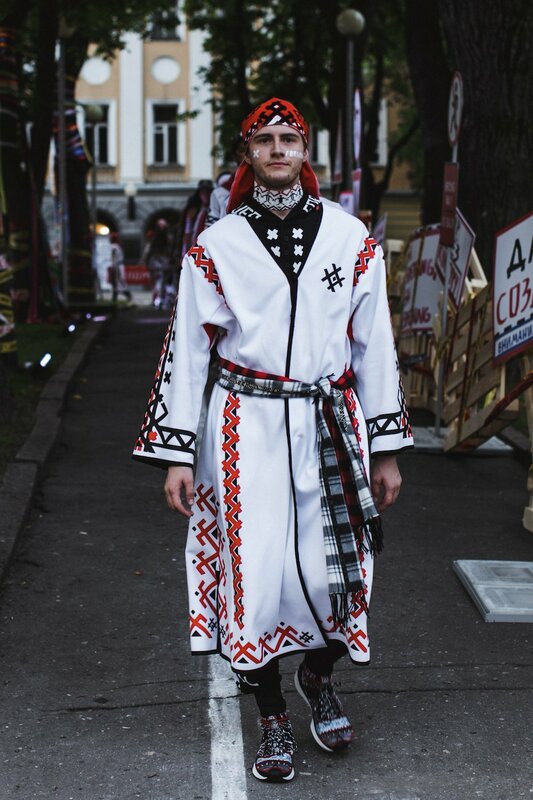 Kazakova’s work for Jahnkoy poses questions which are incredibly relevant for contemporary fashion. It speaks about the value of research, knowledge and community in one’s creative output. It fosters artisinal crafts, while still staying modern. 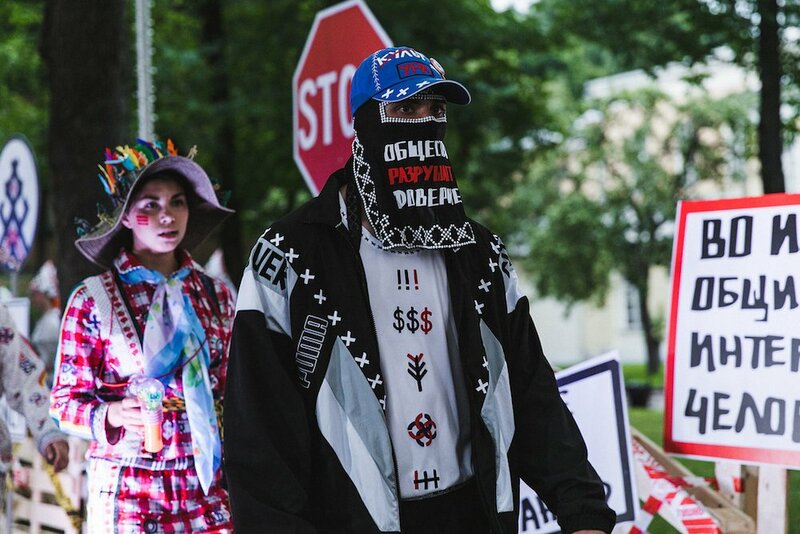 It celebrates the free flow of ideas, signs and meanings yet questions the nature of fashion as a fast and merciless appropriation machine which repurposes everything while discarding its context. That might be why Jahnkoy is different: it’s deeply rooted in its context. Be it Russian heritage or her neighbourhood of Crown Heights, Kazakova also speaks of consumers’ choices we make and how they define us.